By now, most of us know that Bourbon, as American as Jazz or Apple Pie (with a slice of melty Vermont Cheddar, thank you very much), has reached a new and unprecedented heyday. Basically unsellable throughout the ‘80s and ‘90s, when bottles of Pappy Van Winkle gathered dust on store shelves, we now can’t seem to find (or drink) enough of our favorites. New brands show up every day, while stalwarts continue to grow almost unchecked in popularity each year. Throughout Bourbon’s rocky history, through the boom times and the bust, through prohibition and the current craze for anything brown, there is one brand that has somehow weathered the storm intact: Old Forester. The first Bourbon to be exclusively sold in bottles (as opposed to being dispensed from a barrel) to ensure authenticity and quality, Old Forester is also the oldest continuously produced brand in America. During prohibition, it was one of 10 brands allowed to produce whiskey for ‘medicinal’ purposes – probably due to its claims of superior quality from their sealed bottles, which were usually sold out of pharmacies. There aren’t many brands with that claim to fame, and it’s a testament to Old Forester’s flavor and broad appeal. The best part is Old Forester remains an affordable option on our shelves. Each of its five offerings over-deliver for the price of admission, and all of them can be enjoyed equally neat, on the rocks, or in your favorite cocktails. 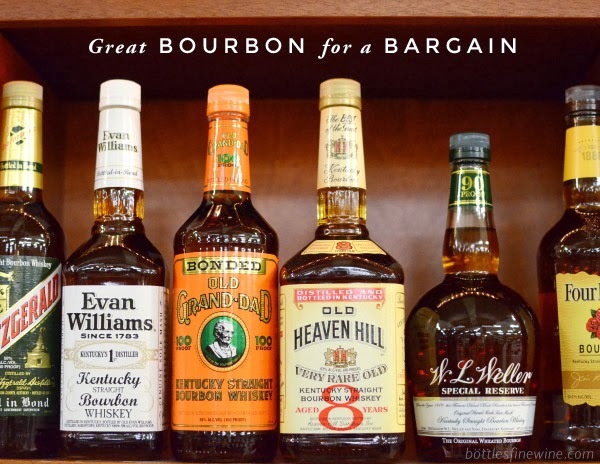 If you’ve never tried one of their Bourbons, come by Bottles and pick one up. We’d love to chat and get you safely home with an affordable, approachable, delicious bottle of pure Americana. The workhorse. Simple & dependable, Old Forester 86 is at home on a Tuesday night over a handful of ice. A little fruity, with a short and clean finish, it won’t get in the way of all the heady aroma in a classic Mint Julep. The stalwart. The difference, as the name would suggest, is in the proof – but what a difference. The extra oomph adds a layer of complexity and nuance to the whiskey, bringing out bright spicy rye notes and hints of brown butter and leather. That heat balances perfectly in a Manhattan, especially with floral Peychaud’s bitters and fruity Alessio vermouths. The throwback. A tribute to George Brown’s original recipe, sourced from three different distilleries and blended to his specifications. Today’s 90 proof release is comprised of whiskey from three distinct warehouses at three separate proofs. The result is a soft Bourbon, full of subtle clove, cinnamon and citrus flavors. This is the Bourbon for a night with good company and the lingering sunset of one of the season’s last grill sessions. The powerhouse. Minimally filtered, and bottled at 100 proof, it’s a robust, intense, spicy kick to the palate. A splash of water, a big honkin’ orange peel, a giant ice cube, and you’re in heaven. Pairs best with Saturday nights and subsequent lazy Sunday mornings. Shake everything over ice & strain into a rocks glass filled with fresh ice. Garnish with a big lemon peel. Stir all ingredients over ice & strain into a cocktail glass. Garnish with orange slice. Drop bitters, then Bourbon, & finally Ginger Beer over crushed ice in a big glass. Drink deeply, my friends. This entry was posted in Cocktails, Learn About Spirits and tagged Old Forester, whiskey, whisky on September 13, 2016 by bottlesfinewine.